Usually my shipyards just build new ships for use in the fleet of MAESTRO. But with the right offer anyone can request a ship or the refit of one. A while ago I heard that Corrington needed one of their captures refit; I heard it was supposedly the strongest Warschooner ever seen in these waters. Of course, I can't not look at such a unique ship. So I decided to let my shipyards take on the challenge of refitting it. The moment it arrived here I was surprised - it looks like it was almost meant to be a frigate, until someone decided they wanted a schooner instead. No surprise, considering that this ship had been build by pirates, who are known to change their minds often. 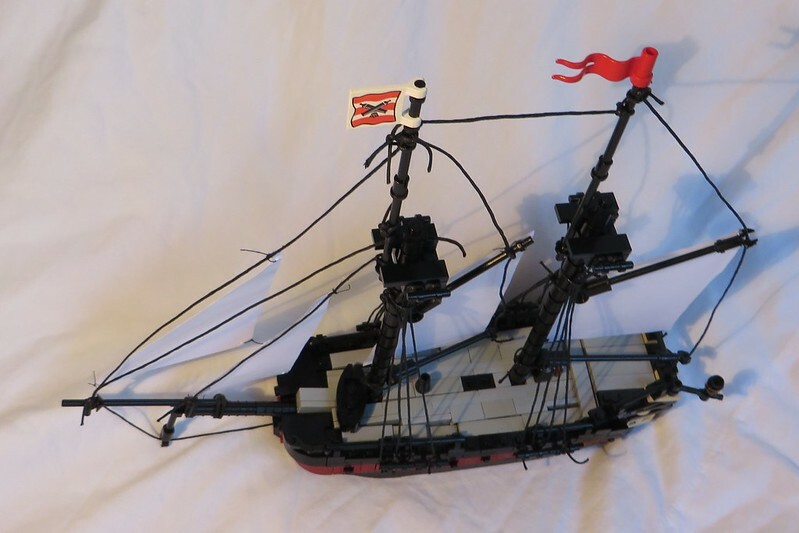 But the quality of the build was surprisingly good - there wasn't as much to repair as I had suspected; the worst were the sails which were completely destroyed in the battle - it fought hard, but had to surrender eventually. Lets hope it doesn't have to do that again. Hereby I present to you: the former Blood Mean, now named HMS Badger in the hands of Corrington, refitted under undisclosed conditions by Monezterrel shipyards. Here we see the Stern of the HMS Badger. And the obligatory view of the bird. This is first build I've build in this scale, and I'm think it turned out quite well. I'm especially proud of the way the curve and tumblehome (although it is almost not noticeable) turned out, the only part I feel like it needs to be redone is the bow, but I just have no idea how to do it better. Even in a small scale, your builds are great! Even if your not building for our fleet, MAESTRO is glad we have you! Fantastic job in that scale! You've got me thinking about trying one in that scale as well. Lovely ship Legostone and as a Corlander I am very grateful for your shipyard's services, great job and thank you! This ship at this scale is excellent ! It's nice to see that your shipyard is not only for building MAESTRO's ships. We are an open company after all ! When I first looked at this I thought “now this isn’t up to snuff with what he’s been doing, what’s he about?” then I actually bothered to read. So, ok. For a mini scale this is pretty good. I do find the bow a bit awkward. The prow shouldn’t stoop where it does, at the red strip and it’s distracting. In general I’m rather impressed by the parts usage. I think a lot of these techniques look good for either a mini or mini-fig scale. Nice job. 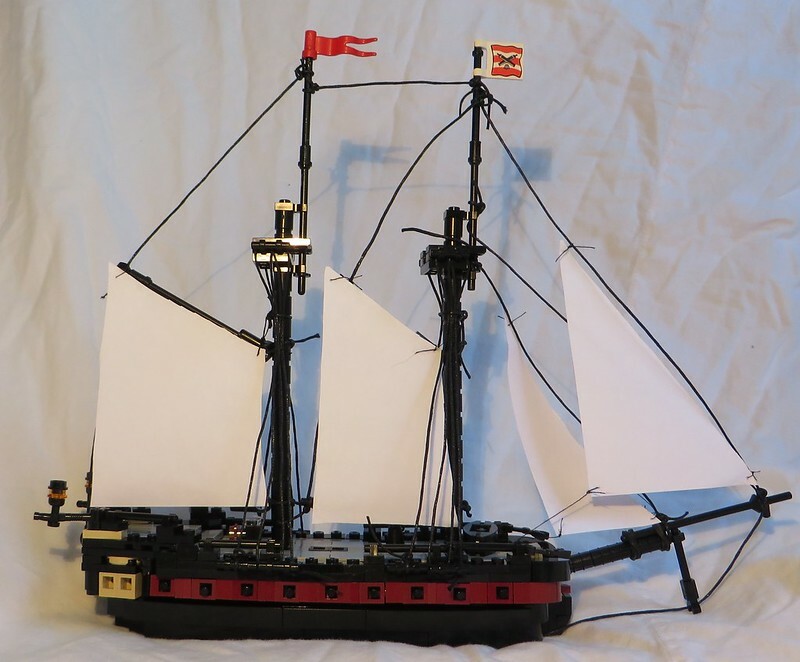 Lovely looking schooner, Legostone - This scale is really effective, and one does not immediately notice its "real" size. I like how you experiment with different techniques, especially since you achieve such great results! I think I will have to try out this scale too at some point, especially for larger ships. I like how this scale balances size with the ability to include details. While the bow is a bit blunt, the overall shape of the hull is very nice and looks very modern (as in Napoleonic-era ) with its straight lines - the cabin is very well done, as is the gunports with its protruding guns. The rigging is quite nice too, although I will make a few comments. 1) I would raise the gaffs (top spars) of the two fore-and-aft sails up to the crosstrees and so increase the size of the sails. 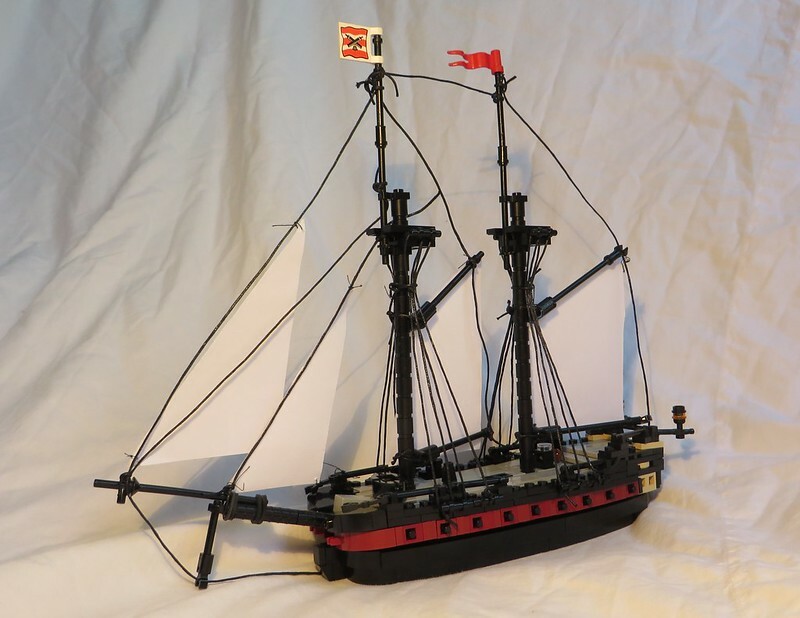 2) Further, you could add topsails (square, on yards, or fore-and-aft, above the current sails) for a more complete look. Good work! I think this will inspire others to explore different scales! Not bad at all! The bow could be better and some ratlines would add to the whole too I think. Interesting. To do as Begir suggests you have to do something about the futtox shrouds. Those are the lines which run from the mast up to the crosstrees to anchor the topmast shrouds. See, the yoke on the gaff can't pass them to get any higher. You could do one of two things though, as it's not a bad suggestion. On the one hand, and I'm just noticing this, you don’t have any topmast shrouds in place, so you could simply for go them. On the other if you wanted to install the missing shrouds or at least keep the futtox shrouds, they can be anchored to the lower shrouds instead of the mast. Put a stopper knot at the height you want the to attach and tie them below that so they slide up that far and no farther. This is the actual historic way of doing this. I tried this on Ramcat before settling on anchoring the futtox shrouds to the mast but found that the tension of the topmast shrouds misshaped the shrouds to a degree that was unsightly.